Just shake It and Spray It! Animal pests are a problem. They eat and damage landscaping, gardens and fruit trees, they leave feces everywhere which can contain HARMFUL BACTERIA, and they tunnel and dig under pavers, gardens and pool decks, causing washouts and depressions. Ready to use 32 oz spray bottle. 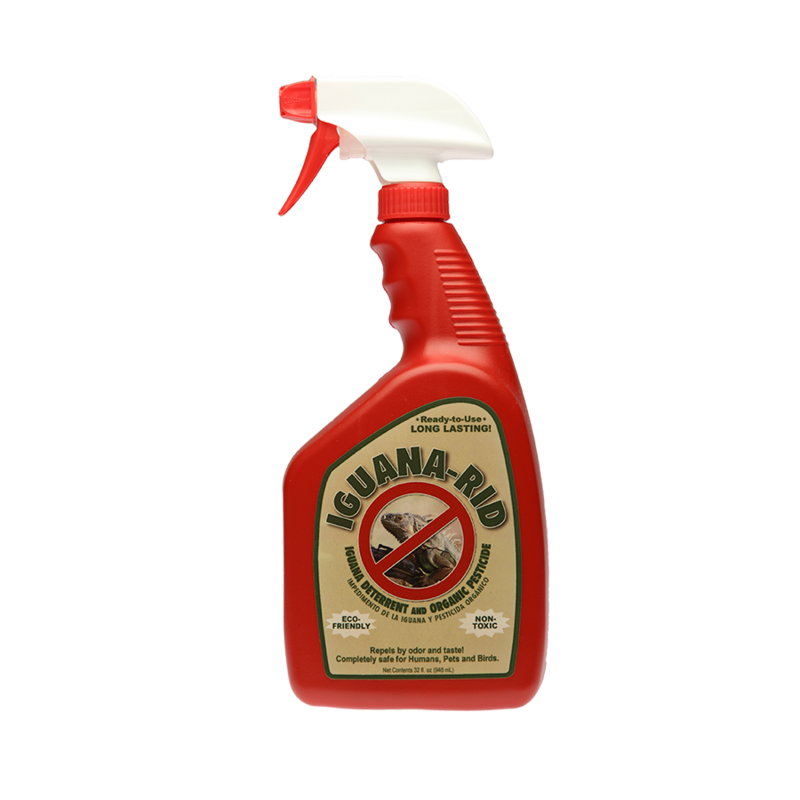 Use this to protect your homes, pools, docks, plants, trees, flowers & shrubs from iguanas, curly tails & other lizards, etc. Animal pests such as squirrels, rabbits, frogs & toads, snakes, deer, raccoons, etc. Garden pests such as mealybugs, beetles, white flies, thrips, leaf-chewers, aphids, spider mites, snails & more! Ready to use 1 gal refill jug. 1. 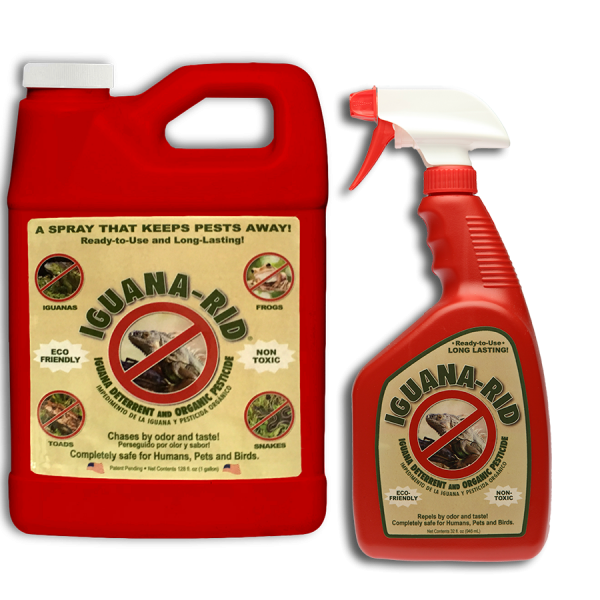 Spray IGUANA-RID thoroughly in all areas where iguanas bask, feed, are seen or there is evidence of their presence such as droppings, claw marks or chewed plants or any other area where control is desired. 2. For optimum results on pool areas, docks, patios, seawalls, decks, and other large areas, a heavier saturation is required. 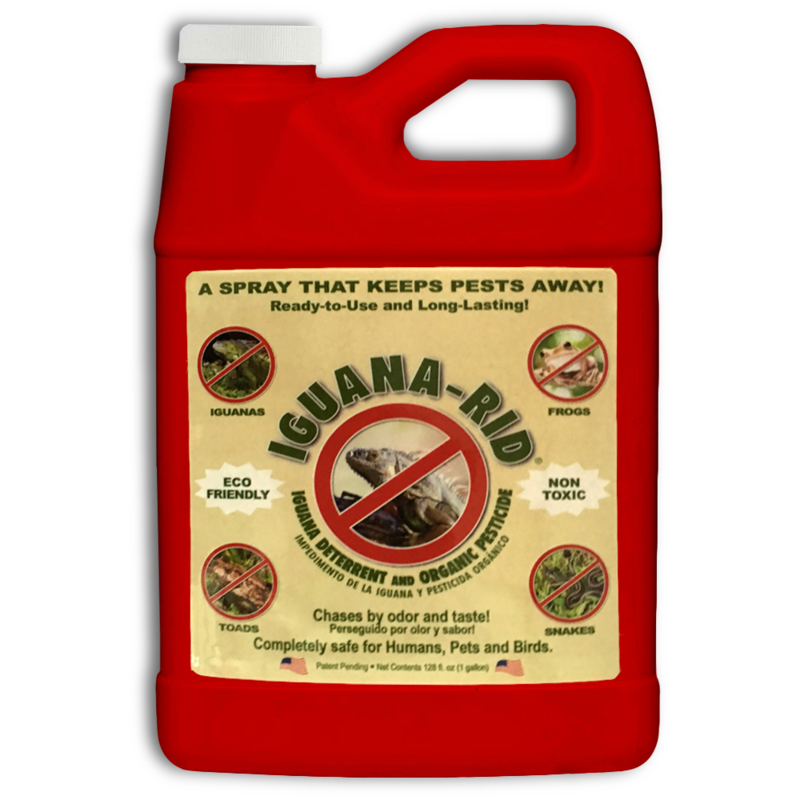 IGUANA-RID is not harmful, and works by producing an odor and taste which is disagreeable to a variety of home and garden animal pests. Initially applying liberal amounts will be most effective. 3. A second, light touch up spray is recommended 2-4 days after the initial liberal application to reinforce the message that pests are not welcome here. Animals are creatures of habit, and as the product is a safe, natural deterrent, it can take several days to a week until the pests get the message. Re application is recommended every 3 to 5 weeks, depending on the severity of the infestation and amount of rain.